Hello and welcome to JENY's HARP (Health and Recovery Plan) Performance Improvement Project (PIP) group. The JENY site is an online forum and a means for several healthcare quality improvement activities in New York State to collaborate on the Web. Originally JENY stood for "Joint Effort New York," but as the community grew it took a more regional and national approach to the health care community. JENY is administered by IPRO, an external quality review organization. This group will have many relevant documents and resources pertaining to the 2017-2018 HARP PIP. It is designed to be helpful for the plans. It makes it simple and easy to find HARP PIP meeting updates, HARP related literature and webinar recordings. Also, as a user, you can Like, Comment, Reply, Post articles and also let us know if a thread post was Insightful. If you have any questions in regards to your account, please don’t hesitate to email [email protected] for further assistance. One of the benefits of Tableau has been mapping data directly from data sources. A quick drag and drop of zip codes onto row and/or column shelves automatically gets translated into longitude and latitude settings for map visuals. Dragging your aggregated variable for analysis onto the Filled Map marks card to 'Color' can help create a easy geographic visual of your data's population. I like how intuitive the software is in figuring out variables as geographic variables based on variable names like 'county', 'zip', 'state' (and if it cannot, there is a solution for that). One thing I found with the zip code analysis in Tableau was that there were these tiny circles randomly showing up in various areas of the map. A Tableau community thread addressed this concern that others have seen also with this mapping feature. These dots may be attributed to post-offices or military bases with their own zips, I believe. SAS Software also allows for mapping data. Various available articles exist online for users and SAS fans to learn from (recommend articles from Mike Zdeb, SAS expert, author and lecturer). For our internal SAS users, map data is provided readily through SAS software (we have license to SAS/Graphs) in various libraries ('Maps', 'Mapsgfk', 'Mapssas'). You can use these various map data to create your visuals or import mapping shapefiles from various sources to create your own custom map or make a random off-the wall map for yourself. I followed along with SAS documentation on creating maps with SAS's map import and proc gmap features to test it out. I could do a county level or state level analysis. But to do zip code analysis, I had to utilize the Tiger zip-code shapefiles from the Census Bureau to generate the map (used proc mapimport). For my analysis, I ran a simple query to get counts per zip and added that data to my generated map using proc gmap. A simple example I created is based on a recent IPRO Kentucky Focus Study on opioid use and MAT treatment for Non-Cancer Chronic Pain Diagnosed Medicaid Managed Care enrollees in Kentucky for the time frame Jan 2015- July 2016 . 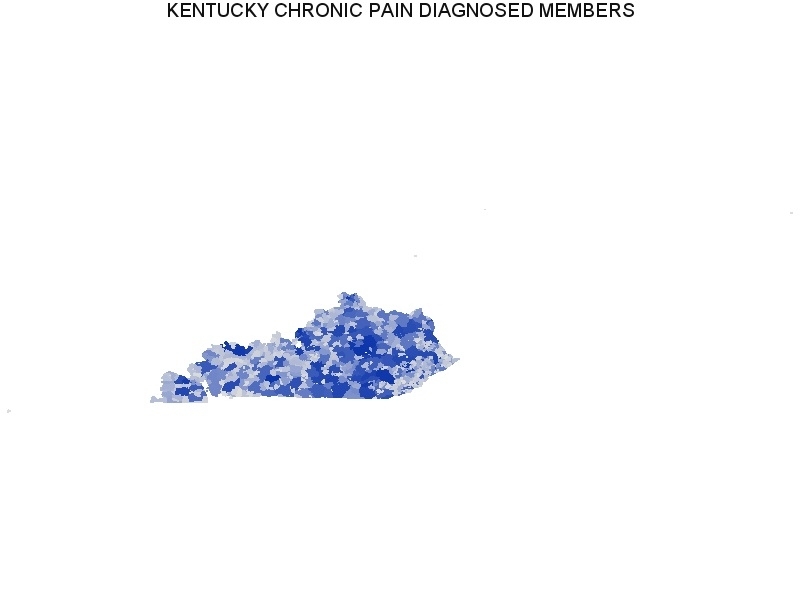 The below is the Tableau image I created showing counts of chronic pain diagnosed individuals in each Kentucky zip code. Here is the map I was able to create using SAS (proc gmap). I know I should find a way to focus the image directly onto the state but will check it out later.